I'm all caught up on the messages that I received. Now if only I'd get a response(s). Last package sent! I hope my giftee likes the things I have sent! Nothing received yet on my end, but USPS tells me that I have a package from DHL arriving eventually, and Amazon tells me that I have one coming as well! It's still a month until Christmas, have a little patience. My package is in the mail! Santa Update: Many of you reached out to me to get additional information/questions for your assignment. I sent out all the messages.... but have not heard back from several people. Know that HeadElf does not know your assignments.... so he can only help if you tell him who you have a question on or need additional information from. If any of you want to give/receive an additional gift, let me know. I will probably do one final assignment last week. Hey, there's nothing wrong with being impatient and wanting to celebrate the Christmas season, as opposed to one day. And tomorrow we will celebrate the season by detangling ~600 lights, retrieving the ladder from the basement and trying to locate the plastic hook thingamajigs that slide into the eaves and trying to avoid serious injury as we decorate the house, followed closely by a round of eggnog and cookies. Lots of ways to celebrate! Not my kind of celebrating. Presents are my kind of celebrating! Just a friendly reminder that the USPS deadline for international mail (both First Class mail and Priority Mail) to arrive by Christmas is Nov 30th for African and Central & South American countries, and Dec 7th for the rest of the world. So that's this Monday (Cyber Monday) and the following Tuesday. If you're a procrastinator, USPS Priority Express International deadline is Dec 7, 9 and 14 at three to four times the cost of First Class mail. and please remember to tick the "gift" box and write "Unsolicited Gift" across the shipping box in large legible letters. In years past, some Santees had to pay import duty and taxes over the value of the gift before even seeing the package. The annual Christmas shopping begins tomorrow. Should have this out next weekend. Depending on when mine arrives, I may not get to open until after NYE as I'm bouncing around a LOT this year. But if it's home before mid-December, I'll open it as soon as it comes. This is why I like Amazon Prime. If I fail at mailing, I can count on them. Oops, I did tick the gift box, but did not write Unsolicited Gift. Do you think that my giftee will have problems? This is the first time I've sent anything international through the mail (in the past, I would simply order the gifts from their local Amazon site to save me the shipping cost). The package was sent to Canada if that matters. My Secret Santa gift from singtx! @singtx I received it last night and I LOVE IT! Thank you! 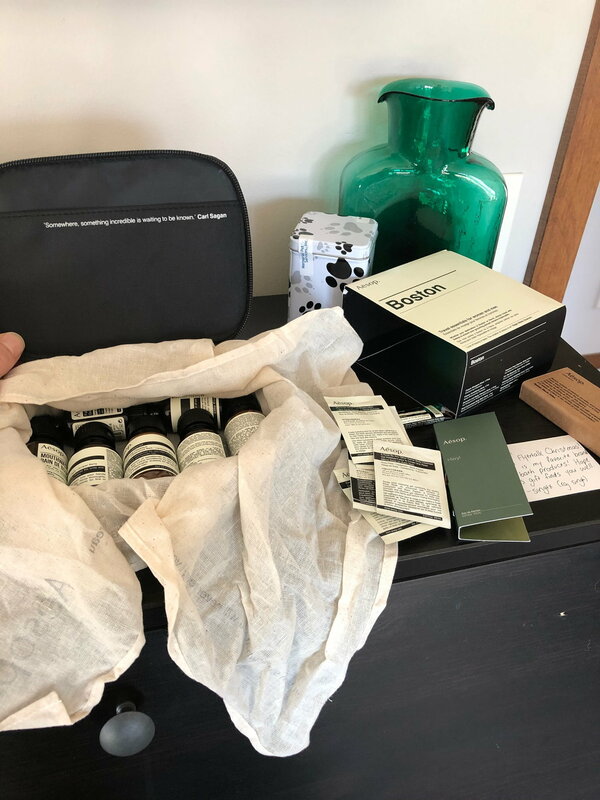 I am going to Shanghai next week and the Aesop products will come in quite handy. Very classy!